Samantha Johnson is currently a classroom Music, Choir, and AVID 6 Teacher at Mare Island Technology Academy (MIT), a public technology based charter school in Vallejo, CA. For more information regarding lessons, resources, and research for this project, feel free to click on the link below to email Samantha directly. I am a native and current resident of the city of Vallejo, CA. I attended various schools in the Vallejo Unified School District during my primary and secondary education. 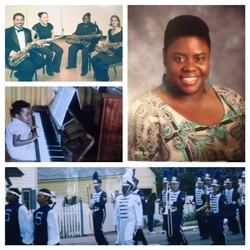 During these years, I was involved with my schools music and band programs. My experience in the public school band programs led me to be invited to march in the 2001 Rose Bowl Parade and also led me to double major in Saxophone Performance and Music Education. Besides music and education, my other passion is Criminal Justice, which I minored in at California State University, Sacramento. While at CSUS, I had the opportunity of participating and performing with the marching band, concert band, saxophone quartet, saxophone orchestra, and the Symphonic Wind Ensemble. Upon completing my Bachelor of Music degree, I entered the Teacher Preparation and Credentials program and completed my course work and field studies with a single subject credential in Music. I am currently completing a Masters in Education with an emphasis in Innovative Learning at Touro University, California. Please click on the links below for greater insight to the Graduate School of Education at Touro University, California and to my Graduate Portfolio for Touro University, California Masters in Education; Innovated Learning. Over the years, I have learned that the success and level of motivation of a student population is directly attributed to the school leadership, the teacher and the learning environment. As a professional educator, I commit to the success of every student by ensuring that each individual experiences the most enriching curriculum that is supported by a wide variety of pedagogical approaches. Prior to teaching music and choir at a technology based charter school, I taught instrumental music (band) classes which the curriculum uses minimal to no technology integration and students who are enrolled in the band elective chose the class personally as their elective course. Music at Mare Island Technology Academy is one of four "electives" courses, however many of the students enrolled in the music courses did not elect to take such course. It became apparent that many students are simply placed into these electives courses because of scheduling conflicts and the lack of a variety of elective course offerings and also the fact that electives classes are not scaffold and are all beginning courses, several class periods become filled with students at varying levels of performance skills, engagement and interest levels, and diverse learning styles and needs to be addressed. The need to increase student engagement and retention of music theory concepts also became evident and became my focus for the Innovative Learning Capstone project. Upon countless hours of research and implementation on student engagement not only in the music classroom but in the classroom in general, students learn best and are highly engaged and motivated when educators and all stakeholders commit to the students as individual learners. However, before educators can provide an enriching curriculum, they must first understand the students and their diverse backgrounds, as well as their different learning needs. Having technology readily accessible is important when integrating technology in lessons and classroom projects. Increasing the use of technology with projects such as student composition and student instructional modules, has allowed me as the teacher to become a facilitator as opposed to a lecturer. As a facilitator of learning, students can develop meta-cognitive skills about their own learning in the areas of communication, critical thinking, collaboration, and creativity, as well as the music content which are skills that are crucial to have as they will increase students’ skills that are needed in the 21st century workforce. Coming into the Innovative Learning program as a Music educator, many of my music colleagues questioned why I chose this particular program, which led me to become apprehensive and second guess myself as to how learning innovative technology would assist me in my future music endeavors. As soon as the program began, those doubts and apprehension quickly dissipated as I began learning new innovative tools such as web 2.0 applications and concepts such as "flipped classroom." The Innovative Learning program at Touro, University, California has helped me become more than just a Music Educator; I am now an Innovator of Learning (Eduvator). With my newly acquired knowledge, I feel as I am much more well rounded with my instrumental music experience, classroom music experience, and innovative learning experience. I am well equipped to integrate all three content areas to become a much more effective educator in all my future endeavors in education. Technology is constantly changing and improving. I will be able to adapt and modify my curriculum with ease with these changes.